It was one of the crucial experiments in quantum physics: when light falls on certain materials, electrons are released from the surface. Albert Einstein was the first to explain this phenomenon in 1905, when he spoke of "light quanta" – the smallest units of light that we call photons today. In tiny fractions of a second, an electron of the material absorbs a photon, "jumps" into another state and leaves the surface. This "photoelectric effect" is so fast that until now it has mostly been regarded as instantaneous – as a sudden change of state, from one moment to the next. However, new measurement methods are so precise that it has now become possible to observe such a process and to measure its duration precisely. 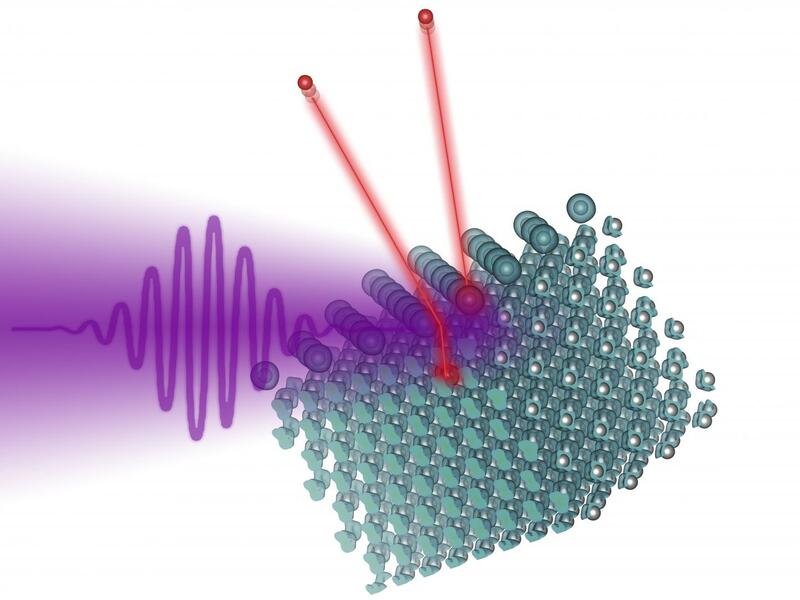 A team from the Vienna University of Technology, together with research groups from Garching, Munich and Berlin, determined the duration of the photoelectric effect at a tungsten surface. The results were published in the journal Nature. "With the help of ultra-short laser pulses, it has been possible in recent years to gain for the first time insight into the timing of such effects," explains Prof. Joachim Burgdörfer from the Institute for Theoretical Physics of the Vienna University of Technology. "Together with our colleagues from Germany, for example, we were able to determine the time interval between different quantum jumps and show that different quantum jumps take different amounts of time." However, until now it was only possible to determine time differences, but not the absolute duration, because it is very difficult to find a "clock", which begins to tick precisely at the beginning of the quantum jump. This is exactly what has become possible through the combination of several experiments, computer simulations and theoretical calculations. To achieve this, the scientists had to proceed step by step: in order to have an absolute, precisely calibrated reference scale, they first studied electrons ripped out of helium atoms by laser pulses. "The helium atom is very simple. In this case, we can accurately calculate the time evolution of the photoemission. For more complex objects, such as metal surfaces, this would not be possible even with the best supercomputers in the world," explains Prof. Christoph Lemell. The helium atoms were then used as a reference clock. In a second experiment, the photoemission of helium and iodine was compared, thus calibrating the "iodine clock". Finally, in the third and final step, it was possible to use the iodine atoms to study the photoemission of electrons from a tungsten surface – the effect, the team wanted to measure. The iodine atoms were deposited on a tungsten surface, which was then hit with ultrashort laser pulses. Now the iodine atoms served as a reference clock, with which the photoemission from the tungsten surface could be measured. An ultrashort laser pulse is used as the starting signal with which the process begins. The electrons are released from their atoms and "jump" into a different quantum state, in which they can reach the tungsten surface and leave. "In tungsten, the duration of this process can be studied particularly well because the interface of the material can be defined very precisely there," explains Prof. Florian Libisch. "The tungsten surface is an excellent finish line for electron-time measurement." But, of course, the goal of the research project is not just measuring the duration of a quantum effect. "It is an exciting field of research that provides remarkable new insights – for example into surface physics, and into electron transport processes inside materials," says Joachim Burgdörfer. "It gives us the opportunity to study important physical processes with an accuracy that would have been inconceivable a few years ago."